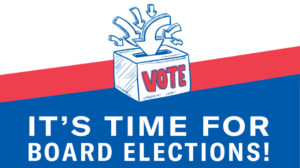 The Board of Directors has authorized the Election Committee to solicit candidates for new members on the Board of Directors. There are three (3) openings for the Board of Directors. If you are interested in contributing your valuable time, please submit your 1 page resume’ to the office no later than 5pm on May 10, 2019. We’re looking for talented and conscientious people with leadership skills to lead and strengthen our park. If this is you, please submit your resume’ If you think this is your friend or neighbor — talk to them about submitting their resume’. Let’s make this a great and competitive election year! This entry was posted in Featured, General Interest, News, Volunteer Opportunities. Bookmark the permalink. 1 Response to Great Board Members Wanted! THIS IS UNFORTUNATE WORDING, IMPLYING THAT THE BOARD HAS TO AUTHORIZE THE ELECTIONS COMMITTEE TO PERFORM ITS DUTIES.